Before I opened our business PurpleMartins-R-Us.com, I did what many people do that want to try their hand at Purple Martins. I went out and purchased an inexpensive plastic house. With the cheap house came a cheap triangular pole, and with the cheap pole came a cheap feeder/platform tray that slides over the pole. Last year I had big problems with egg shells sliding down the inner opening of the platform feeder and sliding down in between the pole sections. What resulted was severe sticking of the pole. So when I attempted to circumvent this issue this year by gluing a barrier around the opening, I was confident it would succeed. NOT! My gorilla glue lasted about 2 months in the sun and came unglued allowing the bits of shell to slide, once again, down the inner hole and in between the pole sections. What resulted was the delay of nest checks on the Sunset Inn house and today’s story. As you may or may not realize, I do not sell these triangular poles on my site. I had a gourd rack on a triangular pole that I phased out this year with the new Economy 12 gourd rack and I am sorry I did not go ahead and phase the triangular poles out in their entirety. It has been a continued headache. I greatly underestimated my desire to hoist up a telescopic pole every few days. Last year one of the plastic tabs that keeps the triangular telescopic pole locked in place broke and I had to use a long bolt in the opening to extend the pole. One pole bent about 10 degrees in a thunderstorm and one developed a very slight bend that made bringing the pole up and down difficult. Then of course there was the problem of the egg shells getting inside the pole sections. I can assure you that next year all my poles will be pulley operated. 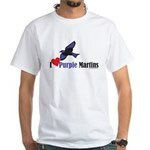 What does this all mean to someone that wants to get into Purple Martins without spending SEVERAL hundred dollars? One can easily spend upwards of $500 to $1000 (and more) for a sweet purple martin set up. Does this mean that you should NOT try your hand at purple martins? No, it only means that if you choose to go the frugal way into the hobby do not be surprised if within a few years you find yourself wishing you had a sweet tricked out Purple Martin set up. Do not feel badly that your cheap system has let you down. You may just find that you have outgrown it. So what do I have on my triangular pole? I placed my aluminum Sunset Inn house on it with a custom made mounting plate. It seems to be hanging in there just fine. It’s my arms that are giving out. And other than the egg shell pain in my noodle, it will serve out this season (I hope) with honor. Finally after a can of WD-40 and much prying and wiggling and banging it came free. 3 delayed nest checks later I was finally able to lower the Sunset Inn and check it and the 2 gourds hanging under it. What did I find? Both gourds have eggs, a total of 7 more for the count and the house itself has eggs but I don’t know how many. “Why is that?”, you ask. Look and see. This is why I love these birds. Stupid? No, she knew it was me. I was fooling with the pole for some minutes, calling out to my husband and when I heard a rustling and looked, there she sat. Calm and trusting. Watching me and knowing. Partners we are. Tethered and wild. Human and not. Surface dweller and flying free. Working together by the grace of God and under His watchful eye. How can one not want to put up a Purple Martin house? This entry was posted on Sunday, April 5th, 2009 at 1:08 pm	and is filed under Daily reflections, Nest check, Purple martins, www.purplemartins-r-us.com. You can follow any responses to this entry through the RSS 2.0 feed. You can skip to the end and leave a response. Pinging is currently not allowed.